Facebook and Google are the two tech giants that in the space of a decade have disrupted the old media industry and created an empire. Google in the late nineties up to these days has built a business model based on advertising, which leverages on two networks (AdSense and AdWords). At the time of this writing, Google’s value is almost eight hundred billion dollars. Facebook, on the other hand, was created by Mark Zuckerberg in his Harvard dorm room back in 2004. At the time of this writing, Facebook has more than a billion users and a market capitalization of over five hundred billion dollars. Both companies have a secret weapon. For Google that is the SERP, while for Facebook that is the News Feed. Both target one thing: users’ attention. The more attention they get, the more they monetize. I’m using for this article the data coming from Similar Web to assess the engagement of the SERP vs. the News Feed. Instead, I’m going to dig into Facebook and Google‘s financials to understand what’s more powerful from the financial standpoint. At the end, we’ll determine who’s the winner based on two things: attention and profits! Back in 2006 a significant transformation silently revolutionized Facebook: the news feed. Before that, Facebook was primarily a directory of profiles. If you wanted to see what any other person in your network was doing, you had to look for that actively. When Facebook introduced the news feed, a new homepage allowed any user to be continuously updated on what her/his network was up to. The news feed is a critical part of Facebook‘s success. In fact, without the news feed, there is no way Facebook could have managed to make its users stick. Also, the news feed is where Facebook monetizes its users’ base. Today we give for granted that Google is an advertising company (as of 2016, 88% of its revenues came from advertising). However, on the 2000s that wasn’t a trivial choice. One of the reasons why Google had been so successful was its ability to create a search engine that offered relevant results through a powerful algorithm called PageRank. It is so popular that back in 2006 the verb “to google” was added to the Oxford Dictionary. The ability of the company to keep users going back to its results pages is also the secret for its past, present, and future success. Before we get into financials, it is crucial to stress why the primary sources of business value for Google and Facebook are the SERP and news feed respectively. When we think about traditional companies, it’s easy to understand what’s their most important asset. Take a real estate company that owns a resort. You know that resort is a vital asset for the company. Instead, when it comes to tech companies, it gets a bit trickier. For instance, if you think about Google or Facebook, what’s their most valued asset? In short, what’s the property that generates most of its long-term business value? Probably the 2,000,000 square feet Googleplex in Mountain View or the 307,000 square feet Facebook data center in Prineville? Undoublty they have enormous value. However, I believe the two most important assets respectively for Google and Facebook are the search results page (SERP) and the news feed. That is the place where each day the battle for the attention of billions of people is fought. Those are also – I argue – the leading company’s assets. Google without its SERP and Facebook without its news feed would be worthless. The engagement of users is crucial for both Google and Facebook. It is true that the SERP‘s logic is slightly different from Facebook‘s news feed. Google needs to be able to provide relevant results quickly and allow its users to leave the results page. Indeed, by clicking on a sponsored advertising – part of Google‘s AdWords network – or by surfing a website – part of the Google‘s AdSense program – that is how the tech giant from Mountain View monetizes. The news feed has an infinite scroll. There’s no limit. You could spend days scrolling that, and you’d be always finding content available for you to consume. In a sense, I’m not surprised that Facebook wins against Google. It is true though that Google in the last years has developed a set of features that also serve the purpose of keeping users for as long as possible on the SERP. Think about the featured snippet (a little box that gives users answers to specific questions) or the more recent people’s also ask feature. Those allow you to find most of the content you need in the SERP. 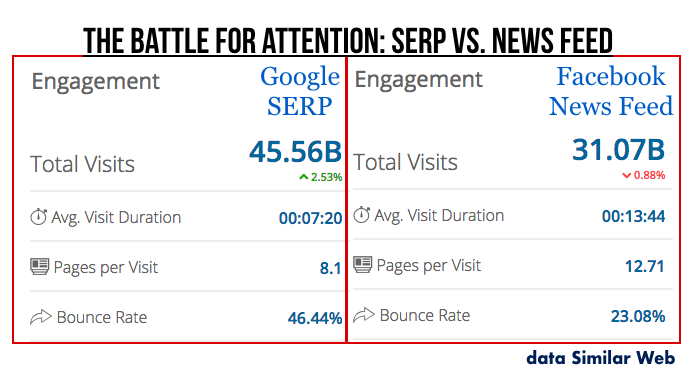 In conclusion, if we compare who’s the winner based on the battle for attention, Facebook‘s news feed shows an average visit duration of 13:44 minutes compared to Google’s SERP of 7:20 minutes. That is quite a long time considering those are averages. In short, there might be people that spend a little time on the news feed; while others might be spending an entire day! Does the battle for attention make Facebook also more profitable? Let’s see! To determine who wins the battle over profits. I’m going to look at one central metric: the operating margin. This metric assesses the effectiveness of a company’s operations. If we had to look at the net income, other factors (like taxation) would be influencing the results. Instead, I want to see how the two companies compare at the operational level. From an operational standpoint, Facebook wins! Even though as of 2017 Google still has almost three times as much revenues as Facebook. If we look at Operating income that becomes only 1.3 times higher. Also, Facebook as of 2017 has an operating margin of 49.7% compared to Google‘s 23.6% (more than twice). Therefore, by looking at the financial operations, Facebook seems to be the winner as well. A little caveat: To be 100% accurate I should have adjusted the Google revenues and operating expenses to reflect only those related to advertising. However, Google provides a breakdown of the sales based on the different segments. While it’s not possible to make the same adjustments for the operating expenses as they get lumped all together. However, the exercise above is still critical to understand the profitability of the two companies based on the overall business. The foundation and cash cow of both Facebook and Google business models is the advertising business. While Facebook as of 2018 is primarily driven by advertising (more than 99% of its revenues). Google as of 2018 makes most of its revenues from advertising (86%). On the one hand, Google has been able to diversify its business model. However, that model is still primarily driven by data collection. Google and Facebook both collect a massive amount of data of their users to monetize them via advertising. While Google monetizes via its search pages or with in-app advertising via the Play Store. In 2018, Facebook primarily monetized via its newsfeed within its products (Facebook, Messenger, and Instagram). Facebook has higher margins than Google, thanks to its cost structure, and the strong brands of its products. Indeed, Facebook and Instagram are very sticky on people’s mind, which makes them connect to those apps without relying on Google. That might seem trivial, yet it is critical. Many brands derive their visibility via Google search pages. While also Facebook does, it is only for a small chunk of it. The remaining is direct traffic going through it thanks to its stickiness (so far). Even though the number of users in the US and Canada has stalled, other products like Instagram are still growing. As for Google, the tech giant is also investing in other areas, hoping a small bet might become the next big hit! Throughout the article, I argued that Google and Facebook most important assets are the SERP and News Feed respectively. By looking at the data from Similar Web, it is clear that Facebook news feed can keep the user engaged more than Google‘s SERP. The financial data confirmed the operational ability of Facebook to be financially more effective. Even though as of 2017 Google‘s revenues are almost three times higher than Facebook. If we look at the difference between operating income, the gap gets narrower. In conclusion, it seems that Facebook news feed could unlock profits for Facebook that – if things stay equal in the next future – will allow Facebook to take over Google. Of course, in tech things change swiftly, and a simple algorithm tweak can also change the future profitability of a company.